•After RivEX has successfully run the build process it checks the RivEX settings file for any outputs you have created using RivEX. Such layers and tables are stored in the Output folder of the workspace and RivEX can load these back into the map document for your convenience. •Simply select one or more datasets to have RivEX load them back into the map. 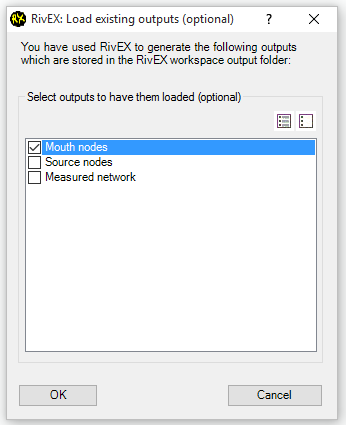 •This is an optional step for accessing output created by RivEX and you can simply cancel the dialog if you do not wish to load such data. For example, you may want to ignore this step as you had augmented the data and now working from a different copy outside the RivEX workspace.